It’s getting to be that time of year. It’s getting cloudier and colder. It’s dark more hours than it’s light and social media is full of opinions and anecdotes regarding the flu shot. It’s flu season, after all. However, the very phrase “flu season” begs the question, “why is the flu seasonal?” Why are people worried about getting the flu shot now, and not in May or June? Does the flu spurn the warmth and love the dry cold? Yet, the flu is prevalent in warm, humid climates as well. Before we begin a discussion about flu seasonality and prevention, we must first understand what the flu is. The common cold is often mistaken for influenza, as they both create respiratory symptoms. However, the flu can also cause symptoms ranging from fever and cold sweats to vomiting and diarrhea. The flu can be quite contagious, shedding itself in respiratory droplets, from a day prior to symptoms, to up to a week after symptoms begin. Over 200,000 people (mainly those with a compromised immune system) are hospitalized with the flu every year in the US. Antibiotics are useless against both the flu and the cold, since both are viral and not bacterial. However, it’s a common misconception that the flu is caused by cold weather. Sure, studies have been done that demonstrate that the flu virus survives far better in cold, dry air and shows higher transmission rates. But only in places in which there is winter. Other studies have shown that the flu virus survives much better and is more transmittable in humid, warm climates. The contradictory results demonstrate our very faint grasp of the flu virus in general, and even more so, its genetic versatility. 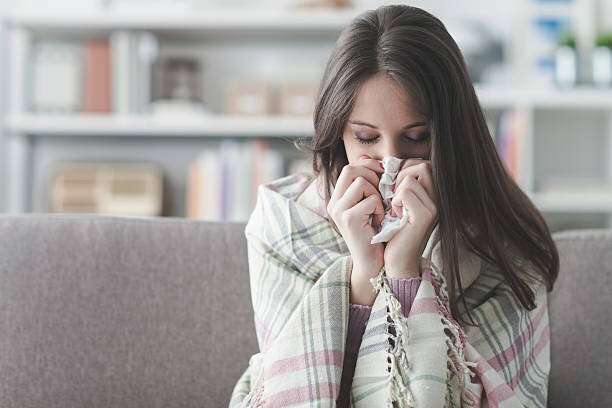 There is one thing both climates have in common during the flu season, and that is more time spent indoors. More time spent indoors means less time in the sun, less time spent exercising and moving around, and more time spent breathing air with others. All these factors diminish our immune system and increase flu transmission. So, how do we compensate for these changes? How best to boost the immune system and avoid getting sick? The Flu Shot: During the best of years, the flu shot has been shown to reduce chance of getting the flu by 40-60%. Keep in mind, the majority of flu shot stats are rarely founded in gold standard studies (the randomized controlled trial), they are based on reporting from a few selected hospitals across the country, so true assessment of efficacy is shaky, at best. Statistics included from the various hospitals and clinics are only those pertinent to the few strains included in that year’s flu shot. So, not included in statistics concerning flu shot effectiveness is those who received a flu shot and got sick from a different strain of flu. Of course, effectiveness also varies between types of flu shot. There are different forms of flu shot that can be administered. The nasal flu shot contains a weakened live virus (attenuated) that is considered impossible to cause actual upper respiratory tract infection. In those with a healthy immune system. The attenuated virus lives in the mucosal membrane of the nasal cavity and instigates immunoglobulin production and then may confer immunity to that particular strand of flu. This flu shot has MSG in it, to further activate the immune system. MSG is a known excitatory neurotoxin that creates neuronal cell damage. MSG use in Europe is strictly limited. The nasal flu shot has been discontinued in years past due to ineffectiveness. It’s back this year with high hopes. Yes, a person who has received this flu shot may spread the flu, but the CDC claims that it’s non-infectious. In individuals with a healthy immune system. The intramuscular flu shot contains pieces of dead virus, designed to activate immunity to a few different flu viruses. However, the dead virus isn’t enough to activate the immune system on its own, so the vaccine contains a few other substances designed to create inflammation and immune system activation. A few of those substances include Thimerosal (a mercury containing additive), formaldehyde, and egg protein. It seems one should be healthy, with few detoxification issues before receiving a flu shot, to mitigate any adverse side effects. Vitamin D is a powerful epigenetic modulator and has powerful positive effects in everything ranging from musculoskeletal health and cancer prevention to protection against infectious disease and autoimmune diseases. At these latitudes, we’re chronically deficient in vitamin D, especially during the winter months and we pay dearly for it. And in the case of the flu, we’re more susceptible to infection. Vitamin D supplementation has shown to decrease incidence of all strains of flu by about 42%. That’s pretty amazing. Studies have also shown that daily supplementation of vitamin D, in children, reduced risk of having an asthma attack by 93%. I could go on and on, but long story short - don’t forget to take your vitamin D this winter. Adjustments: Research done over the last 30+ years has shown, in a variety of ways, that regular chiropractic adjustments beneficially modulate the immune system and positively impact inflammation. Adjustments are one of the most powerful tools we have in improving overall neurological function, and what bodily system doesn’t the nervous system interact with? None. Vitamin C: Many cells involved in immunity require vitamin C to function properly. This is precisely why regular supplementation reduces the severity and length of infection substantially. Once we become infected, however, our need for vitamin C skyrockets, and we need to increase our intake to match. Vitamin C has also been shown to reduce neuronal injury from MSG. So, flu shot or not, take your vitamin C. Ultra Potent-C® 1000, from Metagenics, is fat soluble and therefore highly absorbable. UltraFlora® Immune Booster: This is a top notch probiotic from Metagenics that contains a 50/50 mix of Lactobacillus paracasei 8700:2 (DSM 13434) and Lactobacillus plantarum HEAL 9 (DSM 15312). In an excellent study that came out of Denmark, 1 Billion CFU per day reduced incidence of cold by 18%, reduced the infection by 2 days, and led to a drastic decrease in symptoms, of which sore throat symptoms was reduced most markedly. Roos, R. 2013. Study: Flu likes weather cold and dry or humid and rainy. University of Minnesota Center for Infectious Disease Research and Policy. Xiong JS, Branigan D, Li M. Deciphering the MSG controversy. Int J Clin Exp Med. 2009;2(4):329-36. Published 2009 Nov 15. Brennan PC, et al. Enhanced Phagocytic Cell Respiratory Burst Induced by Spinal Manipulation: Potential Role of Substance P J Manipulative Physiol Ther 1991 (Sep); 14 (7): 399–408. Eur J Nutr. 2011 Apr;50(3):203-10. doi: 10.1007/s00394-010-0127-6. Epub 2010 Aug 28. Whenever I discuss boosting the immune system with others who have autoimmune issues, specifically JIA they always tell me that we can not use immune boosting supplements when on arthritic drugs because it causes their bodies to go into overdrive and can cause flares. Is this true? If it is true, then not very many people can use immune boosting supplements since a lot have autoimmune diseases. I have not seen this with my son at all when he was on the drugs, bc he would haven not had any immune system if I did not use vitamin c.